Since Flash Player 11’s new Stage3D allows us to utilize hardware-acceleration for 3D graphics, that entails a whole new set of performance we need to consider. Today’s article discusses the performance of uploading data from system memory (RAM) to video memory (VRAM), such as when you upload textures, vertex buffers, and index buffers. Is it faster to upload to one type rather than another? Is it faster to upload from a Vector, a ByteArray, or a BitmapData? Is there a significant speedup when using software rendering so that VRAM is the same as RAM? Find out the answers to all of these questions below. Only the magnitude of the advantage changes with this. In particular, if you can manage to upload a vertex or index buffer from a ByteArray, you’re assured a huge performance win. Uploading texture data seems much faster in software compared to hardware: a 3x improvement. As for vertex and index buffers, it’s more of a mixed bag. Software is faster when uploading vertex buffers from a Vector, hardware is faster when uploading index buffers from a ByteArray, and the rest are a tie. Vertex buffers are curiously quicker to upload than index buffers. The difference is more dramatic with software rendering (3x faster) than hardware rendering (50% faster). More so than ever before in my performance articles is it important to keep in mind that the performance results posted above are valid only for the test environment that produced them. These numbers may change on Windows, which uses DirectX instead of OpenGL, or any of a number of mobile handsets using OpenGL ES. Spot a bug? Have a suggestion? Different results on your environment? Post a comment! Note that the numbers vary quite a bit from test to test, with “DirectX9 (Direct blitting),Texture from BitmapData w/o alpha” running as fast as 15ms and as slow as 28ms. One other curiosity to note is that uploading texture data seems much faster in hardware compared to software. I may be reading this wrong, but doesn’t your graph show the opposite of this? Looks like all three types of software uploading can push more bytes/sec than hardware. The graphs are showing bytes-per-second, so you want a higher bar as opposed to most of my articles that are showing time, so you want a lower bar. Sorry for the confusion. On your system, software is faster; vs. where you said hardware is faster in the article. Ah, I see now. I’ve updated the article to have more accurate conclusions on the rendering mode: harware vs. software. My result somehow all the same? Infinity mean what? Heh. Infinity is due to X/0 in AS3 resulting in Infinity instead of NaN; though 0/0 is still NaN. i really don’t understand, why the bitmapdata would upload slower without the alpha-channel. does the gpu need the alpha-channel and therefor all rgb-pixels get converted to rgba or where is this coming from? btw, jackson. it would be nice, if you could create some sort of best-practise article for the new 3dapi, based on your performance-research. Your guess is as good as mine about the alpha channel upload. That does seem plausible though. Hi Jackson, the indexbuffer code needs a correction: You should use writeShort() instead of writeFload() and the size should be size*2 instead of size*4 because each index is only 16bits wide. Wondering if you could revisit this. 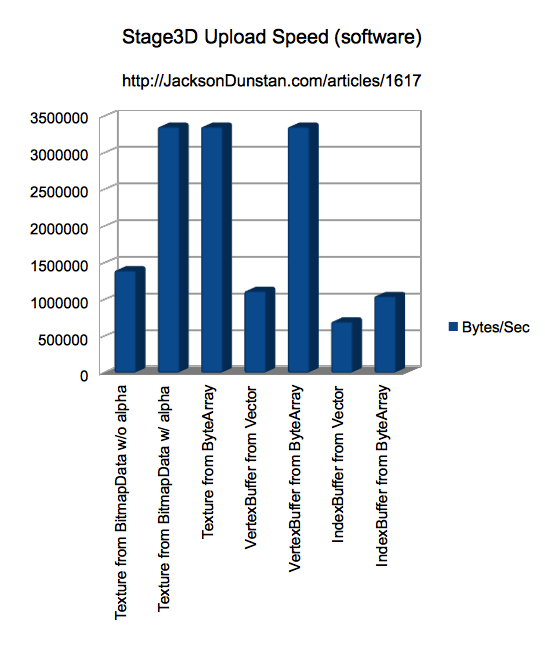 I’ve tested some vectors and byte arrays, and I’m wondering what the cost of updating the bytearray would be if that is incorporated into the test? Roughly I’m showing average framerates of 32-33 for vectors compared to 29-30 for bytearrays… I think this might be due to the fact that you must update the bytearray and this access is slower? Is a ba.writeFloat(…) slower than data[x] = y ??? If I’m understanding correctly, you’d like a test of Vector access as opposed to multiple forms of ByteArray access. If so, this sounds like a great idea for an article and one I can’t believe I haven’t written yet! I’ll definitely add it to my list of articles to write. Thank you for taking the time to follow up. The basic premise behind why this would be an interesting article to write rests in the need for us (as3 developers) to constantly update many values per object per frame into a single vector or bytearray for uploading to the vertex buffer. I have a bit of a delimma. I know ByteArray uploads to Stage3D are faster. Unfortunately, in order to write a series of floats to ByteArray at randomly accessed positions, I have to constantly set the ByteArray.position pointer, and than call writeFloat(). I’m not sure if indexed access is possible here since i’m not writing bytes, but a full float. So, I fear that doing this in the CPU pre-processing step would take up more resources compared to simply updating values in a dense int fixed-size vector, which should be much faster and easier to read code-wise. I guess I can get around this ByteArray problem by using some Domain memory API to handle this stuff, since my application could allocate a fixed ByteArray that I can use specifically for things like vertex data uploads, on-the-fly geometry collision detection, calculations, etc. The stupid thing about Flash is that Domain Memory isn’t available upfront unless I use something like Haxe or Apparat, and I’d also need to register for a license. Anyway, I’m doing such bytearray uploads per-frame anyway, but occasionally for various pooled terrain lod chunks in a quad-tree which are no longer cached (ie. 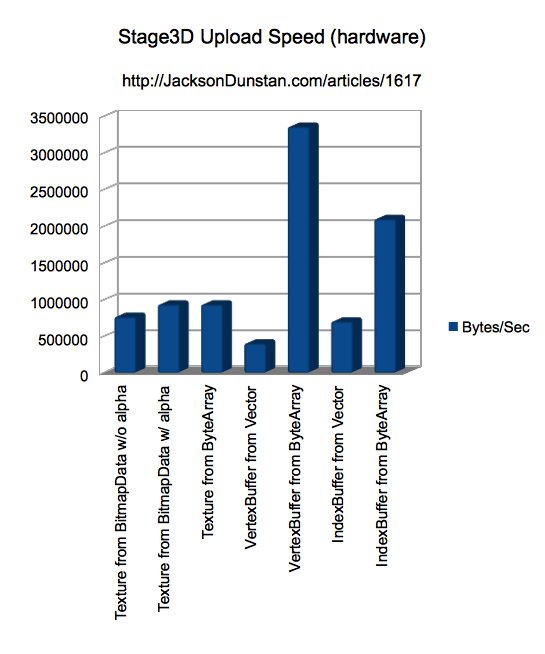 their vertex data was invalidated by other used chunks). So, it doesn’t happen too often across many frames. Thus, no need to pre-maturely optimize things. I haven’t done such a test, but it’s intriguing. This is actually a common problem when using Stage3D with AS3, particularly when you’re trying to avoid the conversion from Number to 32-bit floating point values in uploading vertex buffers and constants. You can avoid it by writing out 32-bit floats to a ByteArray and then uploading that, which really helps CPU usage. In your situation it seems like the ByteArray version may be quicker, especially if you’re willing to go the licensed route with domain memory. Of course there’s only one way to find out. I’ll see about putting together a head-to-head performance test. Well, domain memory is no longer categorised as Premium Features. So, i think domain memory should be the best approach to avoid costly Bytearray manipulation prior to uploading via Bytearray. You only need to manage your offsets/ranges though, since most domain memory implementations use 1 bytearray, so this should be easy to handle with various HAxe libs or Apparat memory managers. I’m having some problems uploading 196000 vertex. It takes up to 15-20 seconds to upload it to the context. Is that normal? No, that’s not normal. In the test from this article I upload 64k vertices in under 50 milliseconds. It’s not that I’m doing anything tricky, that’s just how long it took in the test environment using the normal uploading strategy. Are you using a super slow computer? Are you inadvertently including way more in your time measurement? What are your results using the “Try” link from the article on the same computer that takes 15-20 seconds? It’s difficult to say how much time it takes because the flash player appears to be stopped during 15-20 during the upload. I am porting a customised threejs engine to flash as a fallback for old browsers. Little scenes works great but complex ones increments their rendering time exponentially. We just found a couple of bugs on the JS side, but I definitely have to improve the flash side. Ill tell you something once we fix the JS bug, which is increasing the data unnecessarily. We found what the problem is. Apparently the problem is ExternalInterface. Has problems sending 200000 vertices. My results on 5 years old XPS M1530 with M8600GT. Via notre site web, vous avez la possibilité de télécharger Minecraft 1.7.9 gratuitement. C’est la version du jour que l’on vous propose. Vous pourrez télécharger à haute vitesse via notre lien. I know this article is old, but I have been working with batched geometry and ran into a little problem; hoping you can shed some light on the matter. Adobe Scout reports that uploadFromVector() seems to take longer and longer to finish executing over the course of time when the number of objects to be batched is lower than the maximum number of batched objects allowed in the space from the VBO. When numVerts != BATCH_VERTEX_MAX is when I notice the strange inconsistencies in performance.